We shoot lots and lots of headshots at STP Images Photography Studio. We shoot one person at a time at our downtown studio or at our client’s location. We also shoot dozens or even hundreds of employees at a time in corporate settings. The end result is always the same – great headshots for both business and personal use. A while back, we did some special events with a focus on headshots, but it’s been a while. 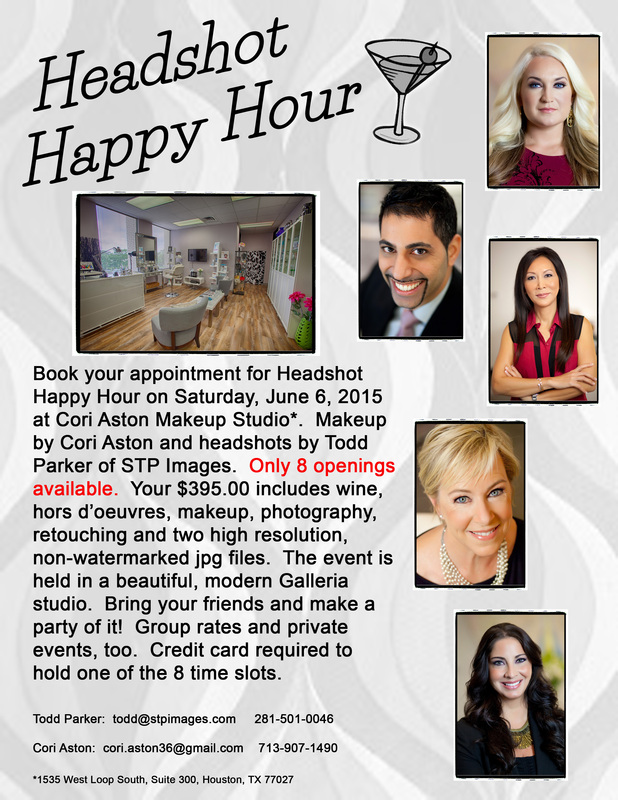 So, Cori Aston has teamed with STP Images Photography to create a new recurring event called Headshot Happy Hour. Headshot Happy Hours will be held at Cori Aston’s makeup studio in the Galleria area (1535 West Loop South). Headshot Happy Hours include wine and hors d’oeurves as well as great music and fun. Bring your friends and make a party of it during your appointment! The very first Headshot Happy Hour takes place on Saturday, June 6, 2015 starting at 11am. Your reservation gets you a full custom makeup session by Cori. Once the makeup has been completed, STP Images will take a variety of headshots right there on location. Each person will have headshots taken using a combination of studio lighting and natural lighting. This will give each client some variety in the headshot choices. Within a week, each client will have a password protected online gallery set up to allow review of the headshots. Each client will select their favorite two (2) headshots. STP Images will then retouch each of the two (2) headshots as requested by each client. For each of the two (2) headshots chosen, each client receives one (1) web resolution jpg (perfect for Facebook or LinkedIn) and one (1) high resolution, print-ready jpg (for use in print publications such as the Houston Business Journal or Houstonia). The package price for each person is only $395.00. This includes wine, food, makeup, headshots, retouching and four (4) final jpg files. There are ONLY 8 TIME SLOTS AVAILABLE! Your credit card holds your reservation. Call us or email us using the info provided on the flier below. We typically fill these quickly, so don’t delay. Let us hear from you soon!